A new annual edition of Economic Freedom of the World has been released. The first thing that everyone wants to know is how various nations are ranked. Let’s start at the bottom. I can’t imagine that anybody will be surprised to learn that Venezuela is in last place, though we don’t know for sure the world’s most suffocatingly statist regime since the socialist hellholes of Cuba and North Korea weren’t included (because of a lack of acceptable data). At the other end, Hong Kong is in first place, where it’s been ranked for decades, followed by Singapore, which also have been highly ranked for a long time. Interestingly, the gap between those two jurisdictions is shrinking, so it will be interesting to see if Singapore grabs the top spot next year. New Zealand and Switzerland are #3 and #4, respectively, retaining their lofty rankings from last year. The biggest news is that Canada plunged. It was #5 last year, but now is tied for #11. And I can’t help but worry what will happen in the future given the leftist orientation of the nation’s current Prime Minister. Another notable development is that the United Kingdom jumped four spots, from #10 to #6. If that type of movement continues, the U.K. definitely will prosper in a post-Brexit world. And if we venture outside the top 10, I can’t help but feel happy that the United States rose from #16 to #11. And America’s ranking didn’t jump merely because other nation’s adopted bad policy. The U.S. score increased from 7.75 in last year’s report to 7.94 in this year’s release. A few other things that grabbed my attention are the relatively high scores for all the Baltic nations, the top-20 rankings for Denmark and Finland, and Chile‘s good (but declining) score. Let’s take a look at four fascinating charts from the report. We’ll start with a closer look at the United States. As you can see from this chart, the United States enjoyed a gradual increase in economic freedom during the 1980s and 1990s, followed by a gradual decline during most of the Bush-Obama years. But in the past couple of years (hopefully the beginning of a trend), the U.S. score has improved. Now let’s shift to the post-communist world. What’s remarkable about nations from the post-Soviet Bloc is that you have some big success stories and some big failures. I already mentioned that the Baltic nations get good scores, but Georgia and Romania deserve attention as well. 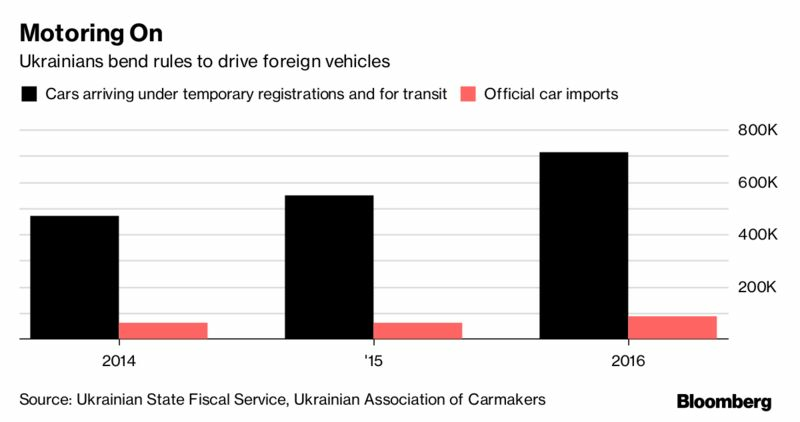 But other nations – most notably Ukraine and Russia – remain economically oppressed. Our next chart shows long-run developments in the scores of developed and developing nations. 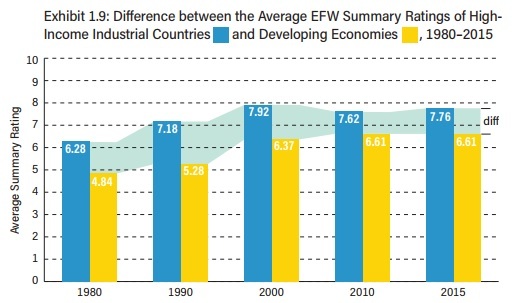 Both sets of countries benefited from economic liberalization in the 19890s and 1990s. But the 21st century has – on average – been a period of policy stagnation. Last but not least, let’s look at the nations that have enjoyed the biggest increases and suffered the biggest drops since 2000. 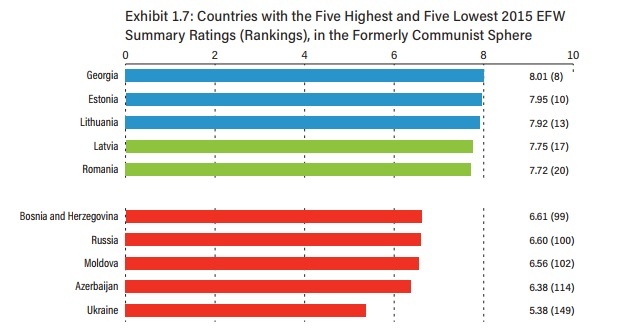 A bunch of post-communist nations are in the group that enjoyed the biggest increases in economic liberty. It’s also good to see that Rwanda’s score has jumped so much. I’m unhappy, by contrast, so see the United States on the list of nations that experienced the largest reductions in economic liberty since the turn of the century. Greece’s big fall, however, is not surprising. And neither are the astounding declines for Argentina and Venezuela (Argentina improved quite a bit in this year’s edition, so hopefully that’s a sign that the country is beginning to recover from the horrid statism of the Kirchner era). Let’s close with a reminder that Economic Freedom of the World uses dozens of variables to create scores in five major categories (fiscal, regulatory, trade, monetary, and rule of law). These five scores are then combined to produce a score for each country, just as grades in five classes might get combined to produce a student’s grade point average. This has important implications because getting a really good score in one category won’t produce strong economic results if there are bad scores in the other four categories. Likewise, a bad score in one category isn’t a death knell if a nation does really well in the other four categories. As a fiscal policy wonk, I always try to remind myself not to have tunnel vision. 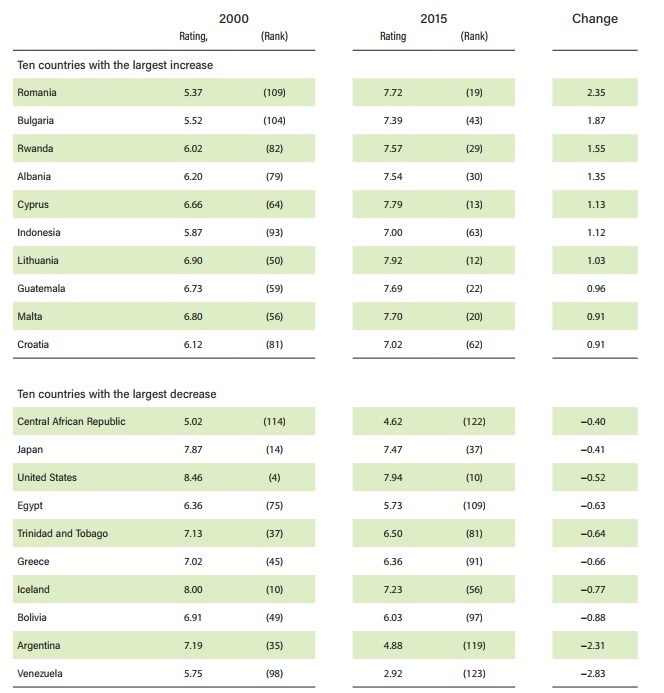 There are nations that may get good scores on fiscal policy, but get a bad overall score because of poor performance in non-fiscal variables (Lebanon, for instance). Similarly, there are nations that get rotten scores on fiscal policy, yet are ranked highly because they are very market-oriented in the other four variables (Denmark and Finland, for example). Perhaps because there’s no hope for genuine Obamacare repeal and limited hope for sweeping tax reform, I’m having to look outside of Washington for good news. I wrote the other day about the very successful tax reforms in North Carolina. So now let’s travel to the Midwest. The Wall Street Journal‘s editorial page has a very upbeat assessment of Michigan’s turnaround, though it starts by noting that many states teach us lessons on what shouldn’t happen. …states can provide instructive policy lessons for better and sometimes worse—see the fiscal crack-ups in Connecticut and Illinois. I definitely agree about the fiscal disasters of Connecticut and Illinois. And Michigan used to be in that group. Former Michigan Democratic Gov. Jennifer Granholm was a progressive specialist in using the tax code to politically allocate capital, which depressed and distorted business investment. Between 2002 and 2007, Michigan was the only state to experience zero economic growth. …misguided policies were arguably bigger contributors to Michigan’s slump. Between 2002 and 2007, Michigan’s manufacturing grew at a third of the rate of the Great Lakes region. …In 2007 Democrats increased the state income tax to 4.35% from 3.9%. They also enacted a new business tax with a 4.95% tax on income, a 0.8% gross-receipts tax, plus a 21.99% surcharge on business tax liability. …Michigan’s economy plunged amid the national recession with unemployment hitting 14.9% in June 2009. But Michigan has experienced a remarkable turnaround in recent years. Michigan…offers a case study in the pro-growth potential of business tax reform. …Mr. Snyder’s first major undertaking with his Republican legislature was to replace the cumbersome state business tax with a 6% corporate tax and trim the individual rate to 4.25%. Michigan’s corporate-tax ranking jumped to seventh from 49th in the Tax Foundation’s business tax climate rankings. …They also reformed state-worker pensions. After the 2012 midterm elections, Republicans passed right-to-work legislation that lets workers choose whether to join unions. In 2014 state voters approved a ballot measure backed by the governor to repeal the personal-property tax for small businesses and manufacturers. These reforms already are paying dividends. In 2011 Michigan added jobs for the first time in six years, and it has since led the Great Lakes region in manufacturing growth. Unemployment has fallen below the national average to 3.9% even as the labor-force participation rate has ticked up. …Unemployment in the Detroit metro area has fallen to 3.2% from 11.4% six years ago. Businesses in Ann Arbor and Grand Rapids say they can’t find enough workers. Perhaps they should try recruiting in Chicago or New Haven. As a fiscal wonk, I’m delighted by tax cuts and tax reform. That being said, I want to specifically focus on the reform of bureaucrat pensions in the Wolverine State. It was mentioned as an aside in the WSJ editorial, but it may be even more important than tax changes in the long run. We’ll start with a short video the Mackinac Center produced to helped stimulate debate. Here’s some of what Investor’s Business Daily wrote about the recent reforms. We’ll start with a description of the problem that existed. For years, Michigan had been racking up pension liabilities for public school teachers that it had no money to pay for. By 2016, the state’s unfunded liability had reached $29 billion — which meant state was funding only 60% of its pension obligations. …Michigan is hardly the only state to have made this mistake. Pressured by public sector unions, state lawmakers boosted retirement benefits, using wildly unrealistic forecasts for investment returns and wage growth to justify them. And here are the admirable reforms that were enacted. So what did Michigan do to avoid Illinois’ fate? It embraced bold pension reforms that will protect taxpayers and provide a solid retirement benefit to teachers. …it’s shifting its public school teachers toward defined contribution plans. All new hires will be automatically enrolled in a 401(k)-type plan with a default 10% contribution rate. Teachers will still be able to opt for a traditional defined benefit pension, but one that splits costs 50-50 between workers and the state, and includes safeguards that will prevent the funding ratio from dropping below 85%. The experts at Reason also weighed in on the topic. Pension analysts from the Reason Foundation (which publishes this blog and advocated for passage of SB 401) say no other state in the country has embraced reforms that go as far as Michigan’s. …new hires will be enrolled in a 401(k)-style pension plan, giving those workers the chance to control their own retirement planning while removing the threat of future unfunded liabilities. …What makes the Michigan proposal unique is it allows future hires to choose a so-called “hybrid” pension system retaining some elements of the old system with a provision requiring pension system to be shuttered if the gap between the fund’s liabilities and assets falls below 85 percent for two consecutive years. The mixed approach, allowing teachers to choose between a traditional pension and a 401(k)-style retirement plan, could be a model for other states to follow as they grapple with similar pension troubles. Though the bill isn’t a panacea. Paying down those obligations will take time—all current teachers and public school employees will remain enrolled in the current pension system and retirees will continue to collect benefits from it—but [it]…would make a big difference in the state’s long-term fiscal outlook. 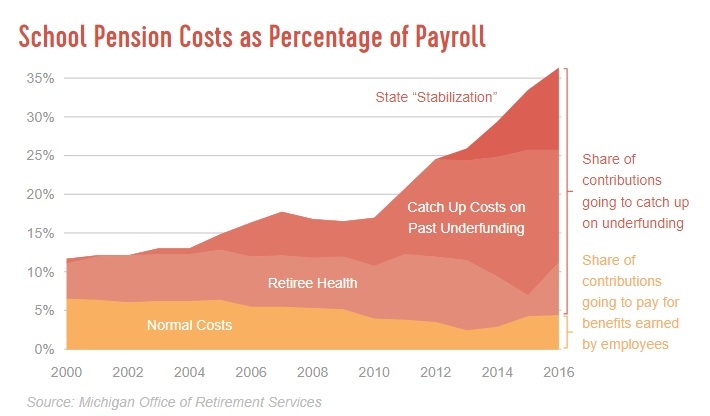 Here’s a chart from the Mackinac Center showing how pensions became a growing problem. Unwinding this mess understandably won’t happen overnight. But at least Michigan lawmakers took a real step in the right direction. The same principle applies in Washington. Reforms to Medicare and Social Security wouldn’t change payments to existing retirees. And older workers generally would stick with the status quo. But proposed entitlement reforms would lead to substantial long-run savings as younger workers are given the freedom to participate in new systems.